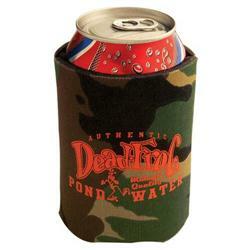 Custom Collapsible Foam Kan or Can Coolers (like a koozie) with your logo in camouflage. Flattens to fit in pocket. 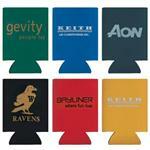 Perfect sports item or tradeshow giveaway! 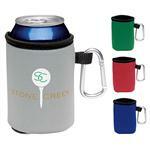 Thin enough to fit in some larger cup holders when holding. FREE 1-DAY RUSH PRODUCTION AVAILABLE. ON SPECIAL NOW! 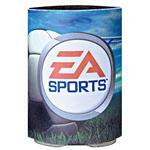 Dimensions: Actual size flat is 5-1/8"h x 4"w.
Typical Imprint Area(s): 2-1/2”h x 3”w each side. Cloth exteriror with felt-lined interior. Actual size flat is 5-1/8"h x 4"w. Actual size open is 4-1/8"h x 2-3/4" diameter. 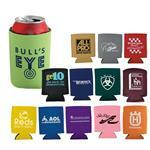 Koozie type can cooler.